The Asian Dramaturgs' Network (ADN) is formed with the intent of mapping and networking the region's dramaturgical experience and knowledge. ADN is collaboratively conceptualised with Centre 42 and held its inaugural ADN Symposium in Singapore in 2016. Since then, various gatherings of dramaturgs, performance makers and arts educators from around the Asia-Pacific region have taken place in Japan and Australia. Centre 42 is the principal organising partner for ADN. 1. TO CONNECT THE VARIOUS DRAMATURGICAL THINKING AND PRACTICES UNIQUE TO THE REGION TO FORM A COMMUNITY OF ARTISTS. ADN recognises and embraces diverse and new ways of working and thinking in dramaturgy. As an increasingly growing critical field in performance, dramaturgy in Asia presents rich and diverse approaches to the discipline due to the region's cultural and artistic complexities and multiplicities. ADN hopes to connect individual dramaturgs in Asia to develop dialogues, discourses, collaborations and other professional and research relationships. 2. TO PROVIDE A FOCUSED PLATFORM FOR ASIAN DRAMATURGS IN THEIR MYRIAD OF METHODS AND APPROACHES TO DRAMATURGY. Sometimes, we do not even call ourselves "dramaturgs", but the fact is we take on the role of dramaturg. ADN envisions a platform of rich exchanges of ideas and resources in various ways of intellectual, artistic and practical collaborations, sympsiums, colloquiums and workshops. 3. TO FORMALISE AND PROFESSIONALISE THE ROLE OF THE DRAMATURG AS A GROWING NECESSITY IN THE DIVERSE NATURE OF CONTEMPORARY PERFORMANCE. Skills-building is important to ADN, to enhance practical and theoretical dramaturgical knowledge and skills amongst working dramaturgs in the regions. 4. TO COMMUNICATE AND EDUCATE ON THE ROLE AND FUNCTION OF THE DRAMATURG IN A MORE SYSTEMATIC AND ORGANISED MANNER THAT WILL BENEFIT PERFORMANCE-MAKERS IN THE REGION. Not all performance-makers have a clear understanding of what a dramaturg does in and for the development of a performance, how to work with one, or even if there is a need to have one. ADN hopes to inform and educate performance-makers about the value of dramaturgy and the dramaturg. 5. TO PROVIDE DRAMATURGICAL RESOURCES TO THE PERFORMANCE-MAKERS AND OTHER ARTISTIC STAKEHOLDERS IN THE REGION AND BEYOND. While being focused in its dramaturgical mission, ADN will also strive to connect and link with other individuals who may have deep working relationships with dramaturgs – performance-makers, theatre directors, choreographers, artists, creative producers, producers, curators, programmers. This resource may also expand to include regional and international artistic, funding, production and infrastructural collaborations and cooperations. 6. TO BE AN ORGANISED PLATFORM FOR EXCHANGE AND ENGAGEMENT WITH EURO-AMERICAN COLLEAGUES AND PEERS. ADN hopes to function as the organisational front for dramaturgs in the region to connect and communicate with our counterparts in the West. ADN envisions a rich exchange of different dramaturgical perspectives and novel approaches to theorising and working in dramaturgy between dramaturgs from all over the world. At Satellite Symposium 2018 in Yokohama, the opening session saw ADN co-directors Lim How Ngean and Charlene Rajendran, as well as Robin Loon, deliver an "ADN Report", summaries of the preceding three symposia. Click here to download the rapporteur's notes on the "ADN Report". The video below, shown during the "ADN Report", contains highlights from ADN's first three symposia in Singapore (2016), Yokohama (2017) and Adelaide (2017). LIM HOW NGEAN is a performance-maker, dramaturg and dance researcher who has been actively involved in the performing arts for over 20 years. He is also the founding director of the Asian Dramaturgs' Network. Earlier in his career, he performed in productions in Singapore and Malaysia as well as wrote reviews and features on dance and theatre for the Malaysian press. In recent years, he has served as dramaturg for dance performances at the Singapore Arts Festival and Esplanade - Theatres on the Bay. 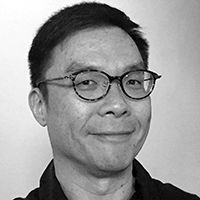 He was conferred his PhD in 2014 from the National University of Singapore for his research on contemporary dance choreography in Southeast Asia. CHARLENE RAJENDRAN is a theatre educator, dramaturg and writer. She has performed, directed and written for the theatre, as well as facilitated theatre workshops and dialogues. More recently she has been dramaturg in interdisciplinary and collaborative arts projects such as Both Sides, Now (Drama Box and ArtsWok, 2013-2018), Ghost Writer(The Necessary Stage, 2016), The Malay Man and His Chinese Father (Akulah Bimbo Sakti, 2016) and It Won’t Be Too Long: The Cemetery (Drama Box, Singapore International Festival of Arts 2015). She also researches contemporary performance, issues of identity and play-based pedagogies. Centre 42 is a theatre development space committed to the creation, documentation and promotion of texts and writings for the Singapore stage. The Centre incubates original writing for production development; provides space for artists and new work creation; and develops a functional archive documenting the histories and processes of Singapore theatre. Importantly, the Centre functions as an independent intermediary amongst makers, enablers and consumers, and strives to be a bridge to connect people by helping and supporting. Centre 42 is developed in collaboration with the National Arts Council (NAC) Singapore, and officially opened in 2014. The Centre is a non-profit organisation with Institute of Public Character (IPC) status.